Women have always played a crucial role in war times but are often ignored or downplayed in history. A great example of this are the Adelitas who joined the Mexican Revolution (1910-1920), who became synonymous with the term Soldadera or Female Soldier, and were a vital force in the revolutionary war efforts against Mexican government forces. It is argued that La Adelita inspired by a Durangan woman, joined the Maderista movement (the revolutionary party led by Francisco I. Madero) at an early stage of the Revolution, and supposedly fell in love with Madero, her revolutionary leader. This popular icon became the source that documented the role of women in the Mexican Revolution, Adelita came to be an archetype of a woman warrior in Mexico and a symbol of action, inspiration among other things. 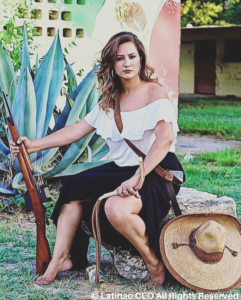 Their active role in the Mexican Revolution contributed to modern day Latinas, Latinx, Chingonas, and Chicanas in United States, and we are seen as either feisty or promiscuous, which is an image we need to change. We are all beautiful, intelligent and passionate women who are mothers, bosses, advocates and career focused individuals and should not accept the image of a feisty and promiscuous follower. Collectively we can combat negative connotations brought on by association and discussions today. I urge you to join forces regardless of differences, to band together and celebrate the work of the Adelitas and others who paved the foundations for today. That collectively we reclaim the honor of these women who sacrificed their livelihood for their rights and freedom. Today I celebrate my forty fifth birthday with a homage portrait of La Adelita and with the launch of a new chapter in life and business phase of LATINA CEO. I hope you enjoy the portrait and know that I am here to assist you with the good fight!